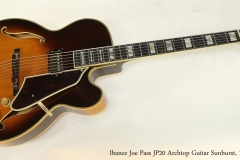 The Ibanez Joe Pass JP20 Signature model was built from 1980 to 1990, as a standard size archtop electric with one humbucking pickup in the middle position. These were likely made at the FujiGen factory, as the serial number doesn’t start with ‘J T’, which would indicate Terada. This early Joe Pass example is in good condition, and appears to be all original, including the faux-pearl buttons on the tuners. The label is signed by Joe Pass. The finish is all around in good clean condition and the original hard shell case is included. 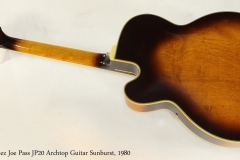 This guitar plays well and cleanly, is currently strung with flat wound strings and has recently been serviced in The Twelfth Fret repair shop.